My three sisters and I (with our husbands) left for the Philippines on March 26. At the NAIA airport, Pastor Reuben Villanueva came to meet us. But it wasn’t just Pastor Reuben who came. Pastors: Erwin Mamhot, and Jared Teves, two adopted ministers from Tawi-tawi came with Pastor Reuben. 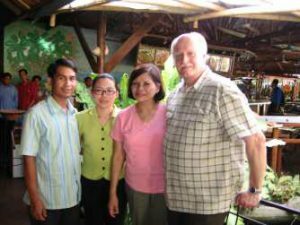 Pastors: Jared and Erwin were on their way to an assignment in Thailand. They arrived in Manila the day before our arrival. It was wonderful to see them. Two days later, we sent them off. As we waved goodbye to them, I felt their homesickness–going to a far-away place to serve the Lord, away from their families and friends. The first leg of our trip was Odiongan, Romblon. While there we joined Romblon Mission during their second constituency meeting. Kelly Babb, my sister Rose’s husband, gave his personal testimony during a devotional. The adopted ministers led the Youth in several meetings and sportsfest. They also asked us to speak in their group meetings. I visited an inmate (Larry) in jail on the day of our arrival in Odiongan. Larry had written me many months ago asking for help. He wanted to be FREE and go to Theology College and become a minister. While in jail, I shook hands with all the 30 inmates new SDA converts through the help of Larry. It was like looking at a group of future ministers for the Lord. Today, Larry is a FREE man and going to Theology School. The following day, J.R. and I went to the Batiano Elementary School grounds to meet some of our group. I didn’t have any idea what for. When we reached the place, a basketball tournament was ongoing. I found a shady bench and started to look around. I saw many familiar faces. 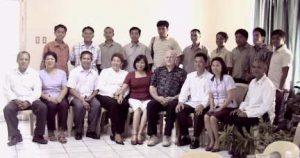 The SPUC and Romblon Adventist Mission presidents and a few others were among the crowd. I wondered why. After a while I started seeing familiar faces in the “Red & White” team. Ah-ha! That’s Danilo, Gerry, Reynante, Walter, Jessie, Vladimer, Radney, Bebot, Ric Jason, Ramil, Jerome, Allan and Reuben? What is Reuben doing here? And Kelly Babb in his green shirt? I was totally surprised! Then I understood why. 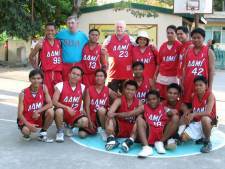 In the two tournaments, the AaMI team won one and lost one. Later, the team gave me my own jersey that says “manager.” I didn’t know I managed a basketball team. In Romblon, we attended a family reunion. 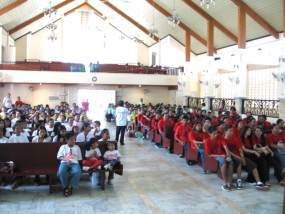 Around 750 Lachica relatives gathered in the Batiano Adventist Church on April 9. It was so wonderful to see folks of different faiths join together to give praises to God as one family. While in Manila, we met adopted ministers: Michael Sam Escosura and Samuel Bernal and their families. Both ministers work in the Cavite Area. Luisa Rauenbusch, a Filipina who is originally from Nueva Ecija but now residing in Australia came with her daughter, Yarani, to go with us to Mountain View College and Northeastern Mindanao Mission. Luisa is married to Gerhard Rauenbusch. They have another daughter named Emely. 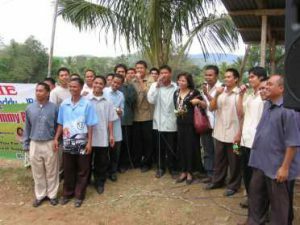 Luisa met two young SULADS Bible workers while in Northeastern Mindanao Mission, which she is now sponsoring in their work with the Manobos of Mindanao. Yarani helped with the young people in the Jamboree SDA Church in Butuan during the nightly meetings. Brian Fennessy, a 24-year-old from Sacramento went with us to MVC and NEMM as well. Brian’s heart is for the children. He started helping the STREETKIDS who sniffed “rugby” and who hung around the Butuan mall. He gave them food. Likewise, he gave food to a group of children on the beach during our picnic. Each time Brian saw a poor child, he offered help. He became quite popular among the children that they called him, “Kuya Brian.” They shouted his name everywhere he went. He also gave sports materials for the young people of Jamboree SDA Church. In March when I found out that a great percentage of the adopted ministers in Mindanao were attending the Church Leaders Congress in Mountain View College, I thought it would be a great idea to go there to meet the adopted ministers for the first time. “Please make everything discreet. We don’t want to disturb the meetings.” I told Pastor Romulo Tuballes and he promised that he would. He also said to expect between 180 to 200 attendees (ministers and families and mission personnel) during the AaMI get-together on Saturday night at the college cafeteria. Discreet? When our van arrived at the MVC gate on Sabbath morning, the first thing that caught my eye was a huge banner hanging on the side of the entrance gate: “WELCOME Mommy Reva & Daddy J.R.” I was taken aback. Upon entering the gate, I saw Pastor Romulo in the middle of the road. Behind him were dozens of adopted ministers and on the right side of the road, a singing group of 6, each with a microphone, was singing a “welcome” song. Another huge banner hung where the singing group stood. Discreet? We got out of the van, met the ministers and had pictures taken with them. It was the best reception we’ve ever had (and which we did not deserve). We lingered around and introduced ourselves, while each adopted minister introduced himself to us. Back into the van we drove toward the auditorium where Sabbath service was ongoing. On the top eaves of the auditorium were other huge banners that said “WELCOME Mommy Reva and Daddy J.R. and company” from the missions of Mindanao. Discreet? 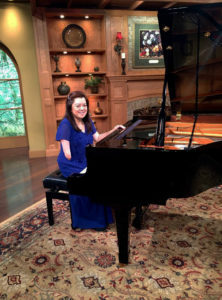 In the back room of the auditorium we met dozens of adopted ministers. I tried to name each one as they came to me but I could name only a few of them. They all seem to look alike all of a sudden! It was surely overwhelming! I couldn’t believe that we would see the adopted ministers face to face finally. At the Valencia Hotel where we stayed, we all helped put together the gifts we brought for the ministers. Since we were so limited in weight in the plane, we only brought the lightest things. Here we are placing gifts in gift bags. The get-together was held on Saturday night. Around 6:30 p.m. my group went inside the cafeteria and then the door closed behind us leaving a forming line outside. The adopted ministers and their families had to wait before they could come in while the Cafeteria folks prepared the tables and food. Later, with Ruth, Rose, Luisa, Yarani, Shari, Reuben, Kelly and Brian in their respective places at the “welcome” table, we opened the door. One by one, they came in. It was so wonderful to see everyone. In no time, the ministers wanted to have pictures taken with us. I stood on one side of the cafeteria while J.R. was on another side. I appointed Arville Ectin to be the cameraman for the night and he did a splend id job! So many of them posed for pictures and often, I couldn’t tell who they were. Then the program started. Romulo and his appointed members did a great job on the program as well. The cafeteria was packed. The speculated 200 attendees multiplied to 452! Of this number, 153 are the adopted ministers of Mindanao. And the mission presidents, ministerial secretaries and wives were there, too. Each group of adopted ministers from each mission rendered songs of welcome. A few selected adopted ministers gave their personal stories. Likewise, each mission president and the SULADS’ director spoke. Pastor Serrano gave a most inspiring message to the adopted ministers. Toward the end of the program, the wives and children received gifts. The adopted ministers received a token a flashlight key chain imprinted with AaMI and a little sum for their transportation expenses. It was an awesome experience. I could feel the presence of Jesus, Himself, as if He was there listening, observing, very happy for us all. After the get-together, our group left the following morning for Butuan, a 7-hour drive. While there we stayed at Pastor Rudy Nermal’s residence for the rest of the week. For 4 nights, we attended a nightly meeting at the Jamboree SDA Church. Kelly, Brian and Pastor Rudy were the speakers. Pastor Solomon Mongaya invited us for lunch at the mission conference room on Friday. 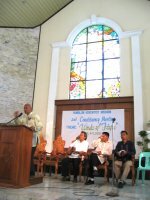 On Sabbath afternoon we met all the adopted ministers of Northeastern Mindanao Mission in the Jamboree Church. There was a baptism that day. We met our newest adopted minister (whom we placed a week before our travel). Francis Danquah, originally from Ghana, South Africa, was a Methodist preacher who became a Seventh Day Adventist pastor. Francis is quite amazing. He can give his sermon fluently in Cebuano, a Filipino dialect. Because of this, many folks love to invite Francis to speak in their churches. Ten days later we went back to Manila. Ruth, Rose and Kelly went back to U.S. on Sunday. Brian left on Monday while Luisa and Yarani left for Australia a day later. J.R. and I had ten more days and decided to go to Bacolod with Pastor Reuben. We let the Lord plan this trip and surely, He did. We found out that the adopted ministers of Negros Occidental Conference were attending the workers meeting the day after we got there so we discreetly planned a get-together lunch at the Pala-pala Restaurant. This time everything was discreet. 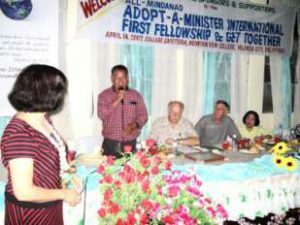 Pastor Edgar Lopez told the adopted ministers that one of their sponsors wished to meet them at Pala-pala. Only the mission president, ministerial secretary and treasurer were told it was us. I believe the adopted ministers were surprised to see us. We met all the adopted ministers except for three who were having a crusade a few hours away. 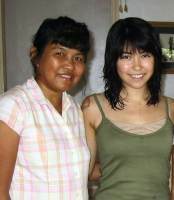 I also met for the first time Jhen Taping (now Minasalvas), my sponsored student in MVC. A few days later we boarded a ferry for Iloilo. On Thursday morning we met ten adopted ministers of WVC during a lunch in the mission conference room. Each adopted minister gave his work report. Then Pastor Estores, president of WVC, gave his report of the work in his mission. It was thrilling to see pictures of the many new church buildings sponsored by folks from U.S. and their big number of baptisms. We learned that day that two of the adopted ministers have just been absorbed by WVC. This trip made J.R. and I realize the impact that this small organization has done for hundreds of Theology graduates. 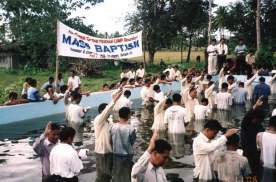 And most importantly, for the great number of precious souls (over 30,000 baptisms in 2006) who found Jesus through the hard work of the ministers. We can just imagine their sacrifices–working from dawn till midnight, many scaling mountains, crossing rivers, riding small boats to islets—under the scorching sun, or chilly downpour of the rain, and often leaving their families behind for long periods of time. The small salaries that they receive aren’t enough to sustain them everyday, yet they toil wholeheartedly for the Master, for His great commission to fulfill. The adopted ministers showed their appreciation for us and for all the sponsors who selflessly send them monthly support. Their happiness showed on their faces, in their actions, in their words. They know that many people care about them and their loved ones. From Iloilo, we went back to Manila and left for U.S. two days later. Definitely, God was with us on this trip. It was a heartwarming and the best of the three trips that we’ve taken in the past three years. We met so many wonderful people along the way. We also saw many folks who need help. Definitely, the Lord’s work is progressing in this part of the world. We saw the adopted ministers’ dedication and enthusiasm to share God’s ‘good news’ to this fallen world.